Here is a great excuse to use Poblano Peppers that are still in season and prepare a delicious sauce that helps reduce the spiciness of the peppers. This is my own version where fresh corn and Mexican fresh cheese is added. Serve with grilled chicken and a salad for a full meal. This easy recipe will not disappoint you. I am lucky enough to find poblano peppers at my local Farmers Market with the spiciness that I remember growing up with. Nowadays what you find at the supermarket is lacking in flavor. The addition of the cream will help reduce the heat of the peppers. Heat oil in a skillet over medium heat, add onion and garlic. Cook until onion is transparent, about 5 minutes. Place the roasted poblano peppers, cream, milk and chicken bullion into the blender. Blend until you have a smooth sauce. Add the sauce to the skillet and cook on low for about 6 minutes. Add corn and peppers strips if using. Stir frequently. Add the cooked paste and mix or serve the sauce over the pasta on each individual plate. 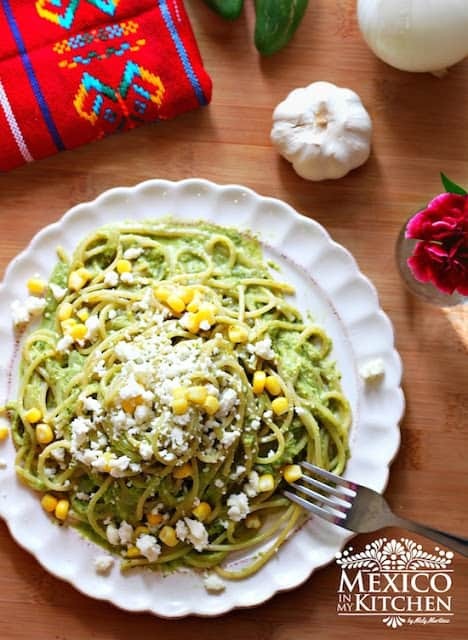 Pasta with Creamy Roasted Poblano Sauce. 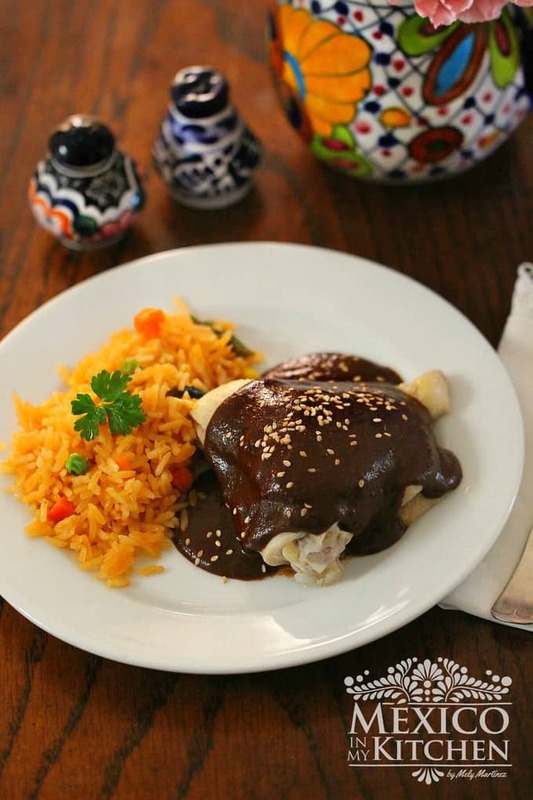 Here is a great excuse to use Poblano Peppers that are still in season and prepare a delicious sauce that helps reduce the spiciness of the peppers. This is my own version where fresh corn and Mexican fresh cheese is added. While we prepare the salsa cook the pasta according to package instructions. Drain and set aside until you add the sauce. Add the cooked paste and mix or serve the sauce over the pasta in each individual plate. 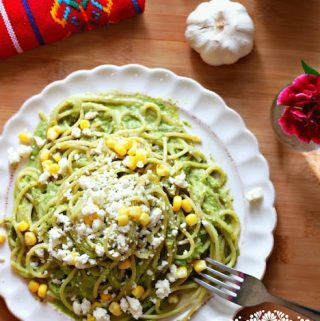 – In Mexico, this dish is traditionally made using spaghetti, but you can use other types/shapes of pasta. – If you like, reserve some strips of the peppers for garnish. 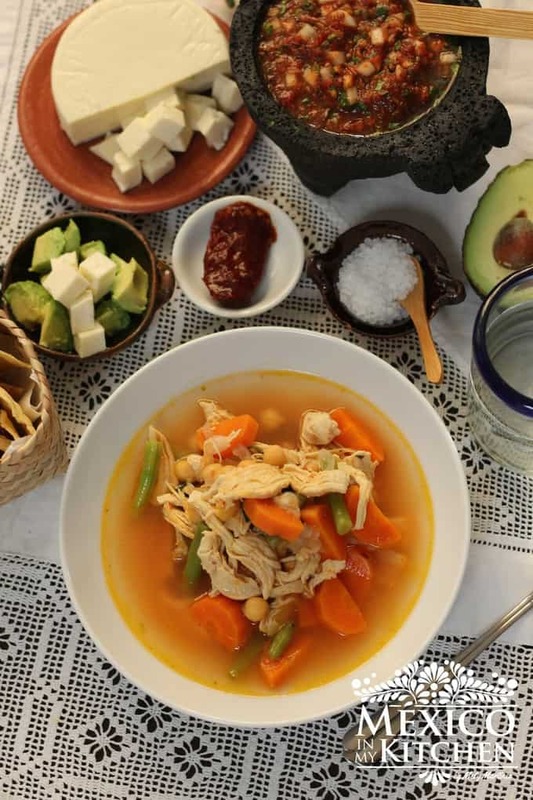 – I very rarely used Chicken bouillon but in this recipe, it works great. If not using just add salt to taste at the end. – Yes, you can use other types of creams like sour cream or cream cheese if Mexican Cream is not available, the same applies to the cheese. My son loves this pasta and is always asking that I include it in our monthly menu. Try it at home and let me know if you like it. Previous Post: « Molletes… or Should I Say The Mexican Bruschetta? This looks wonderful,Mely! Just delightful! La combinacion de los chiles con la salsa y la pasta se ve realmente exquisita…como todo lo que compartes 🙂 Espero que estes disfrutando la semana! Si esta es una combinacion exquisita que nos encanta. Espero que tu semana este tambien super. I just roasted some Poblanos yesterday for some shrimp chile rellenos. This looks like a really good pasta sauce… one I'd love, but I'd have to throw some meat in there for my gardener. Ha! Shrimp Stuffed poblanos, sounds like a great dish. I usually serve this pasta with grileld chicken. Pinned and stumbled this! That sauce would be great on enchiladas too, can't wait to try this. The sauce alone goes really good over chicken breast or other meats, but enchilada will be superb! This looks very good Mely. I love the combination of poblano peppers and corn, it really taste delicious. Nice recipe. I too made roasted poblano sauce once. Delicious Mely no body can say no to this. I hope you try it this way. You won't be disappointed. qué rica es ésta pasta verdad Mely?? me gusta taaaanto el chile poblano, es tan delicioso! Un saludos amiga!!! gracias por la receta!! oh this sounds wonderful! i will definitely try. thanks for sharing! Mely, this is a pasta that I would love! Roasted poblanos are the best. This looks delicious! Oooooo been searching for this recipe… Sound so good can't wait to try this tomorrow…. Excellent recipe….made it with shallots instead of white onion and added cilantro and shrimp…..I can't stop eating it! Soooo good! Oh, my gosh!! I just made this sauce. Thank you for the recipe. I had some roasted chiles to use up out of my freezer and this sauce was so simple and easy to make. And it tastes amazing. I'm going to try it tonight over some edaname noodles (it's all the noodles I have in the house). Plan to put the leftover sauce over quesadillas tomorrow…I just love your site, you got me started making queso also. Making that tomorrow! Hi one question, do you also blend the onion and garlic? I usually don't place the onion and garlic in the blender to mix with the other ingredients. But, that doesn't stop you from doing it. I'm pretty sure some cooks do that. Enjoy! And happy cooking! Thank you for this lovely recipe. This dish taste really great and I have already made it twice!